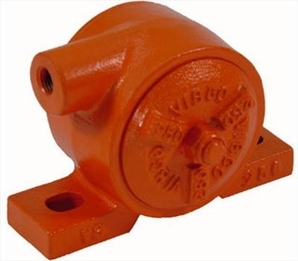 • Use VIBCO VS Turbine Vibrators on any new installation or to replace your old, noisy, messy ball or piston vibrators. • VIBCO VS Turbine Vibrators feature a built-in muffler, are virtually noiseless, and are ideal for rough applications. • Rated for continuous duty. • Available in a variety of food-grade and sanitary finishes. • 7200 VPM, 10.5 CFM, @ 80 PSI, with 500 lbs. of force. 70 dB. • A Filter-Regulator is recommended for optimum life & performance.